Even though the weather is now miserable looking and not the sort of weather that makes me want to go out into the garden, I do have to mention some great garden tools that Big Boy and Top Ender were sent by Wilkinson's that have been perfect for helping me in my attempts to clean up the garden and create a space where Big Boy and Top Ender can safely play and Daddy and I can relax and enjoy the fruits of my our labours. 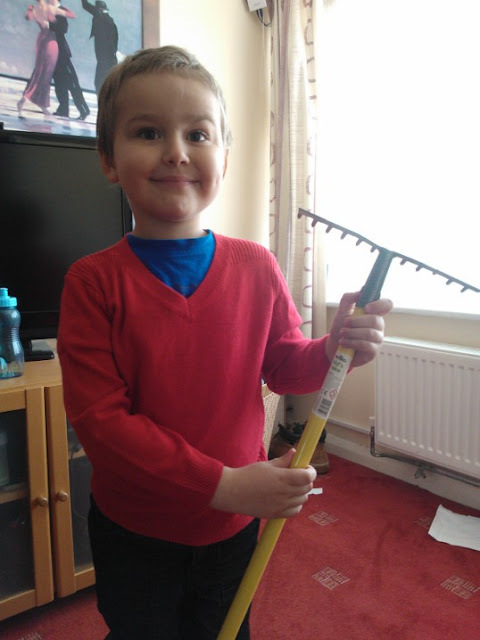 Big Boy was most impressed with the rake, (£3.50) and we've spent hours pretending to be Sideshow Bob from The Simpsons and it's been very handy as after I mowed the lawn Big Boy was able to help me rake the cut grass. 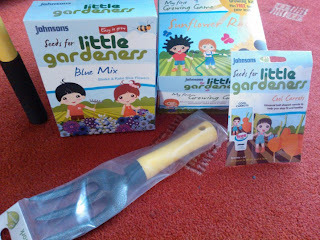 We were also sent a little gardening fork (£1) and some brilliant seeds, some carrots (£1 and I'm hoping we will rival our potato growing skills in years to come), some seeds for a Blue Mix (£3 and they're in the front garden, you just shake and rake in the soil) and a rather clever Sunflower Activity Kit (£5) which is a game as well as a Sunflower growing kit. I just hope that we might have better luck with these sunflowers than we did last year, where they sort of died and didn't grow. Do you have any tips? How do you grow a huge Sunflower? We were sent the items to review, and they've been rather handy with all the gardening I've been doing!